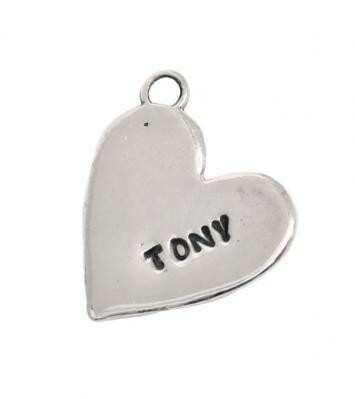 "Silver Stamped Name Charm, Large Heart"
Have you added a new addition to your family and need another charm for your mother's necklace or charm bracelet? Our stamped silver Large Heart Charm is a customer favorite. The stamped Large Heart Charm was one of our earliest charms and continues to be a favorite. This sterling silver charm can be stamped with up to 7 characters. Up to 7 characters can be stamped on this charm in our Nelle or Lizzy font. The charm is approximately 3/4" x 7/8".